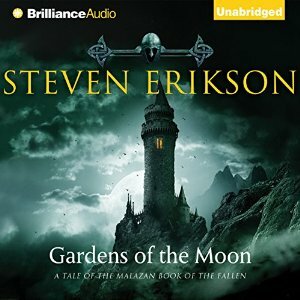 It has been a stupidly long time since I finished listening to Gardens of the Moon. Literally over a year! Like, how is that even possible? (Answer: obviously, I don’t spend enough time listening. Particularly, what should be an obvious commute activity is mostly taken up by a radio show that I continue to enjoy greatly.) But: I did finally finish my reread (relisten? 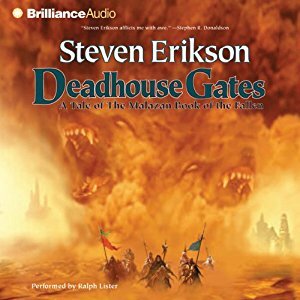 both are technically incorrect) of Deadhouse Gates. I definitely reacted differently from last time, and I’m not sure why. I mean, I have guesses, but there are a lot of variables, so. The primary thing is, the Chain of Dogs. I have always remembered that tale, and I know it made a huge impression on me even then, due to documentary proof. This time, it took pretty much last place. I was most interested in Fiddler and Kalam’s quest to have an, um, discussion with Surly. As for Felisin’s path… I would be better able to discuss my new reactions if I remembered what my old ones were, but I definitely found her sympathetic despite her best efforts. But yeah, Duiker and the refugees: either knowing the outcome in advance deflated the tension entirely, or else something about the performance undercut it. I’d bank on the first one, though. As usual, most or all of the secondary and incidental characters were fully realized (as honestly is the world, despite my sometime inability to fully understand what I’m seeing). Including one Iskaral Pust, upon who I partially based my most recent RPG character. I very much look forward to continuing, and I suppose I can, now that I’m not behind on reviews again. Maybe I’ll do a better job on the speed, this time? I’m pretty sure my friend Kenn had read at least a handful of these prior to his consecutive reading of the full series, and I’d be interested in whether his thoughts parallel any of mine, here, assuming he remembered the individual volume well enough. Alas, he has no way of knowing that this review exists. 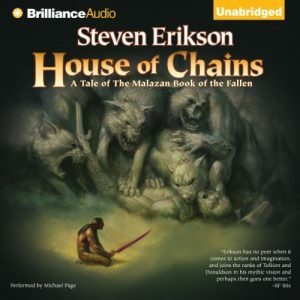 This entry was posted in Words and tagged audiobook, epic fantasy, The Malazan Book of the Fallen on June 26, 2017 by Chris. In a first for me, I listened to an audiobook that I had not previously consumed with my eyes. 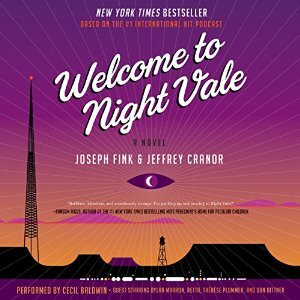 I don’t expect to repeat the experience, but Welcome to Night Vale is a special case. 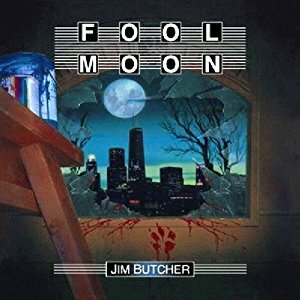 I’ve been listening to the podcast for about two years now, after hearing it evangelized during New Year’s 2014, and when they announced the book, they also announced the the audio version would be narrated by the same person who has performed as community radio host for Night Vale lo these many years. As for the story… I’m not sure how accessible it was (or was meant to be) to a new reader, but to be fair, the podcast is barely accessible, unless you just love it right away. 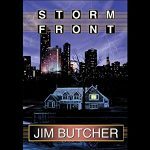 It tells the story of a couple of previously named bit characters as they interact with each other, the town, and a mysterious, previously unnamed major character. Which I think was the best way to handle it. Give the fans something to chew on while giving the newcomers people who have never really mattered before, so they can come in fresh. Overall: it’s a good book, about time, family, parenthood, and the different ways these things affect each other and also, of course, how they affect people. Plus, there are terrifying librarians and tarantulas and video stores to contend with. There’s no good reason why you wouldn’t like this book. But then, there’s no good reason for anything, really. This entry was posted in Words and tagged audiobook, fantasy, horror on February 10, 2016 by Chris.